Studded with sensors, optimized by algorithms, interfaced via dashboards and apps, cities are imagined as computers writ large, planned âfrom the Internet up.â Yet this new age of sentient urbanism â in which place-based intelligence is reduced to âsmartnessâ â has a long and deep lineage. 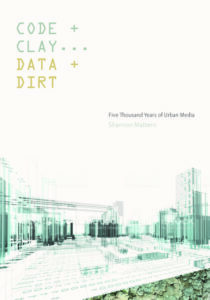 This talk, drawing on her new book, Code and Clay, Data and Dirt: 5000 Years of Urban Media, will take us on a world tour of cities that embody various materialities of intelligence: both code and clay, data and dirt, ether and ore.
Shannon Mattern is an Associate Professor of Media Studies at The New School. Her writing and teaching focus on archives, libraries, and other media spaces; media infrastructures; spatial epistemologies; and mediated sensation and exhibition. She is the author of The New Downtown Library: Designing with Communities; Deep Mapping the Media City; and Code and Clay, Data and Dirt, all published by University of Minnesota Press. She contributes a regular long-form column about urban data and mediated infrastructures to Places, a journal focusing on architecture, urbanism, and landscape, and she collaborates on public design and interactive projects and exhibitions. You can find her atÂ wordsinspace.net.